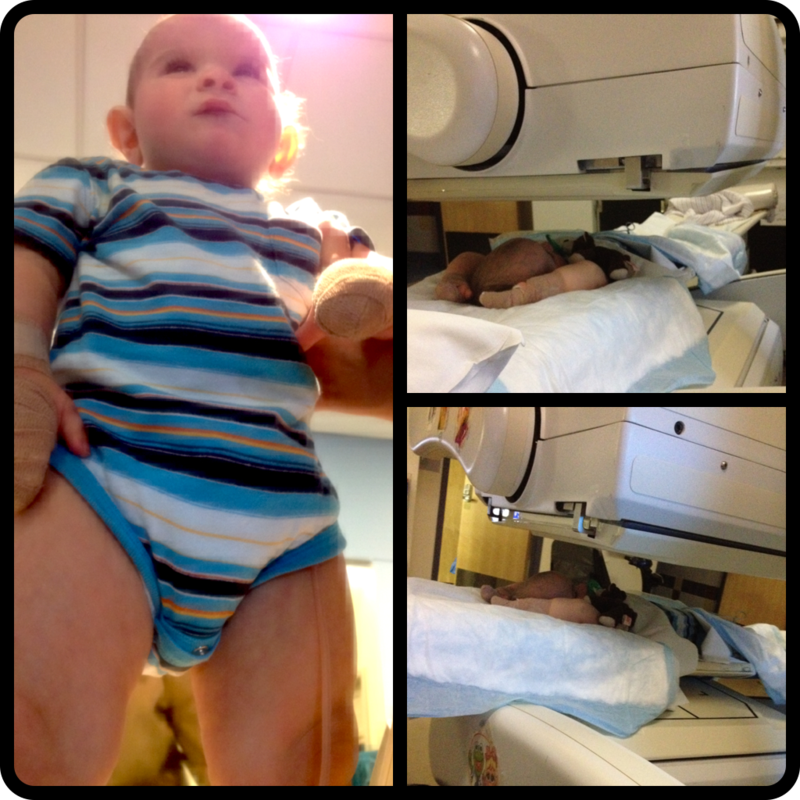 Friday, we went for a Gastric Emptying Scan at Dell Children’s Hospital Imaging Center. What the heck is that, right? My thoughts exactly, well now I know! We arrived at 8 to register and fill out paperwork. 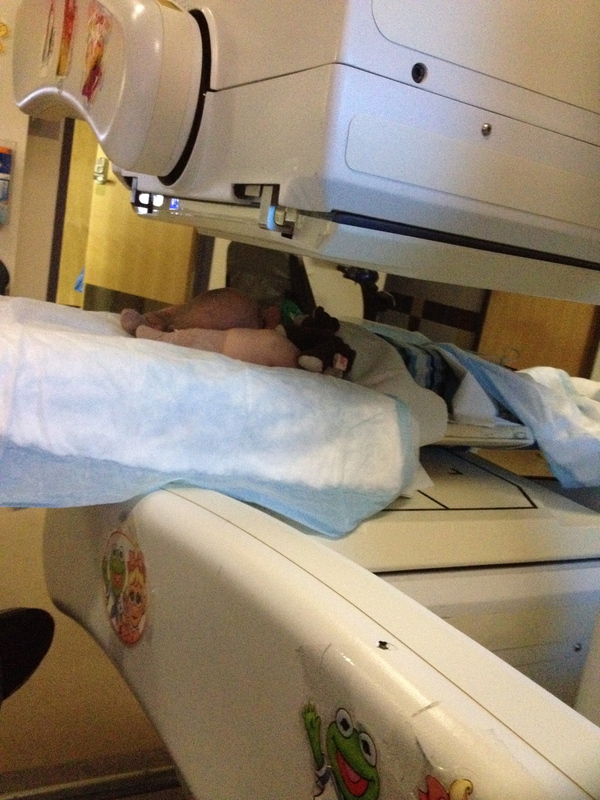 Braxton had to stop all fluids by midnight the night before so his tummy would be completely empty for the test. 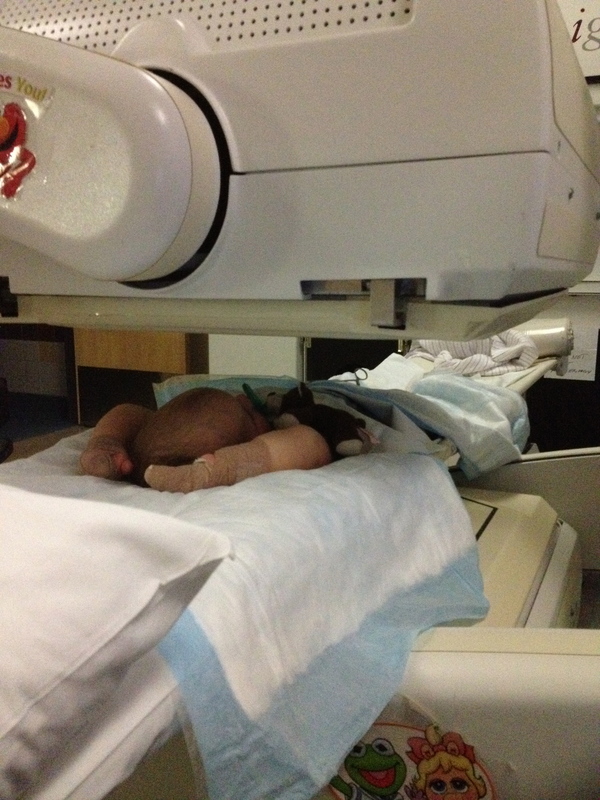 At about 8:30 they took us back to the Nuclear Medicine room to prepare. 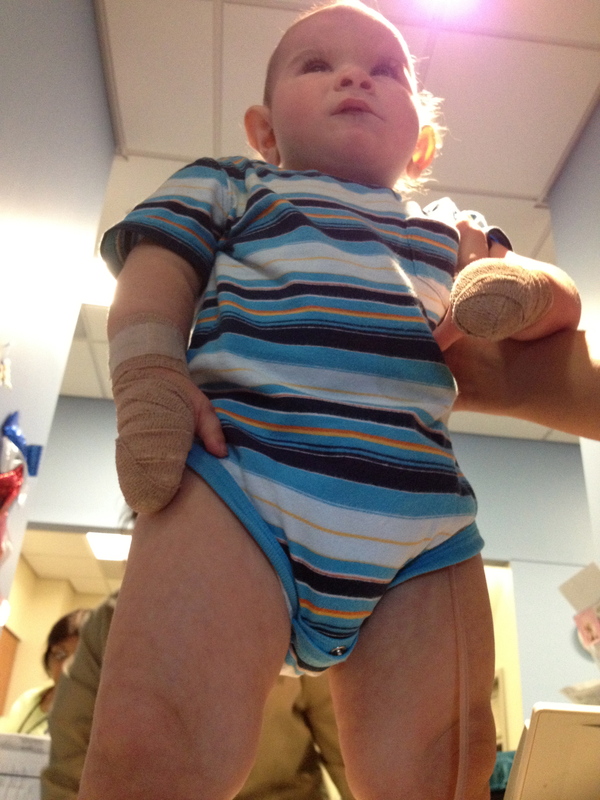 Braxton was strapped down to a small board with some velcro straps. Wasn’t as bad as it sounds. The test was to take about an hour and a half so they had to make sure he would stay still. 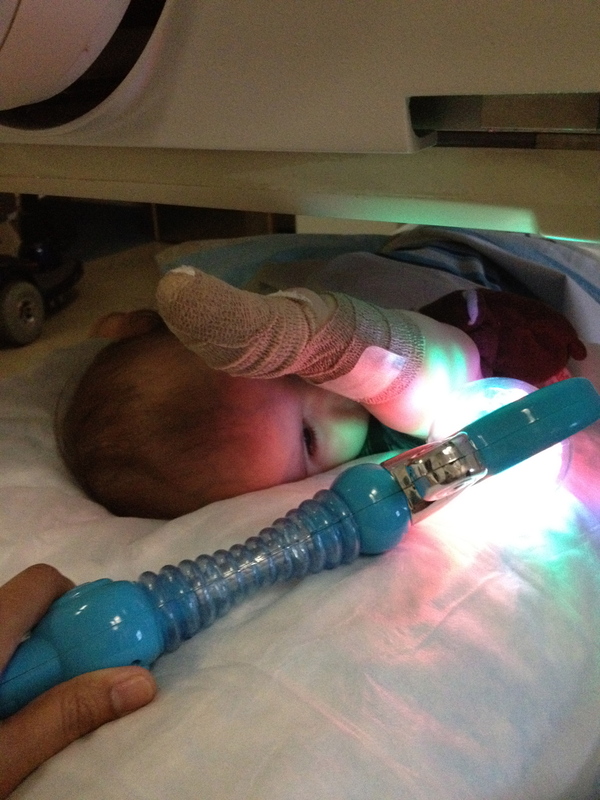 They used Braxton’s regular formula (Pediasure peptide) and added a special radioactive contrast. Braxton was given 3 ounces of formula mixed with the contrast pretty quickly. They moved the table to start the procedure. 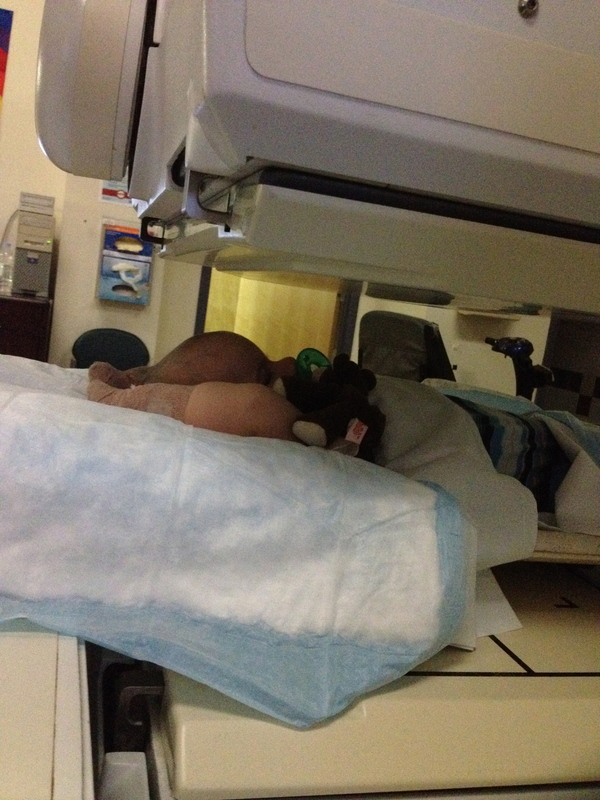 Above and below the table were x-ray tablets that would scan his tummy constantly throughout the hour and a half. 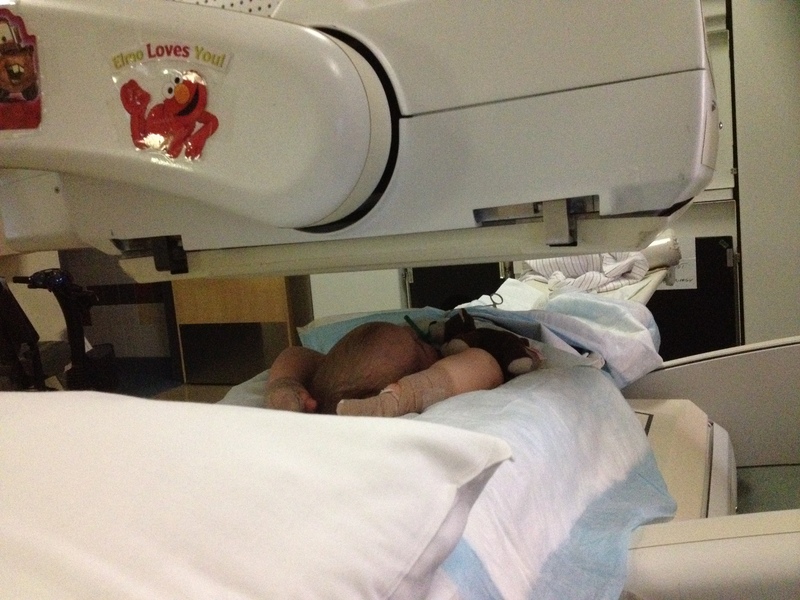 The purpose of the scan is to monitor the amount of fluid in Braxton’s stomach over the course of an hour. The x-ray every minute helped the radiologist to see if his stomach had emptied out the fluid that was put in. The images were then to be sent to his Dr so he could determine if Braxton was having issues emptying his stomach properly. If so, that would explain the vomiting due to volume in his stomach. If not, well, I’m really not sure what happens if not. I’ll have to call and talk to the nurse or doctor next week once he’s had a chance to review the results of the test. After about an hour of scanning they radiologist determined it was ok to stop the test since it appeared that he’d emptied over 50% of the volume they put in. She then took a few extra pictures of his chest to see if any of the fluid had entered the esophagus which would prove whether or not he has reflux. Brax slept for about the first 30 minutes of the test, but once he was awake we talked and played with him and just tried to keep him still for the remainder of the test. He was such a champ through it all. He started to fuss a little the last few minutes of the test, but overall he was great throughout the test. Braxton standing on the desk like he owns the place. Having spent man days in the hospital when my daughter was that age, I empathize. It’s tough. My thoughts are with you.